This beautiful mountain town lies nestled in the foothills of the Pyrenees on the French side and marks the start of the trail to Santiago de Compostela. It’s steep, narrow cobbled streets are a delight to wander and their are many Albergues, Hotels, cafes and outdoor shops for last minute supplies. 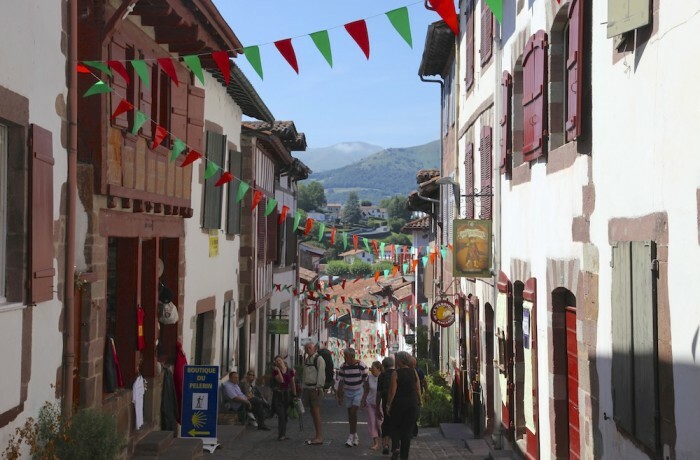 St. Jean de Pied Port literally means “Saint John at the foot of the mountain pass”. The 14th century Church in the town centre is the traditional starting point for the Camino and many Pilgrims come here for a blessing before they start their journey over the Pyrenees the next day – reckoned by many to be the hardest day of the entire Camino as it’s also the first. The cobbled ‘rue de la Citadelle’ runs down the hill in the centre of town and over the river from the fifteenth century Porte St-Jacques to the Porte d’Espagne by the bridge. From the bridge, there are nice views of the old houses with balconies overlooking the River Nive. P.S. love your informative site and we are waiting for our maps to arrive.